James LaBrie is mostly knows for his role as the lead singer of progressive metal superstars Dream Theater. In the past he released already two solo albums under the name Mullmuzzler. 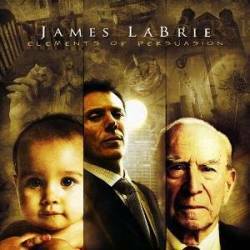 Elements Of Persuasion is thus the first solo record he does under his own name. First of all, this is a record that turned out heavier than expected. With his backing band consisting among others of ex-Extreme drummer Mike Mangini, Italian guitar hero Marco Sfogli and keyboarder/co-songwriter Matt Guillory, LaBrie crafted an album totally without the help of his Dream Theater mates. The question we may ask now is how successful he is. Elements Of Persuasion is not a progressive album in the vein of musical complexity as is the case with his main band. Instead it is a contemporary hard rock / metal album that is never afraid to use very heavy guitars (as on the opener), just to follow up with a more moderate song only a couple of tracks later. This somehow makes it hard to follow a line. The song writing is very good, although the probably intended lack of simplistic melodies will force you to listen many times before you get every single nuance. But no one said that music has to be easy to consume. I am still wrestling with myself whether I prefer the hard metal songs or the softer pop songs, although I surprisingly tend toward the latter, as LaBrie's voice just works better with more melodic elements. This is no Dream Theater. Instead of ten to forty minute long suites of musical extravaganza, you get twelve regular songs that never want to be more than they actually are. The musicianship is flawless, of course, and never trying to sound over the top. My personal problem is the same I had with the solo album of Rush's Geddy Lee: you recognise the trademark vocals, but the usual context is missing. For all those of you who think that Dream Theater are going too far, this might just be the album for you.